The Texas panhandle may be the world’s largest wind farm. We came up a rise on I-40 just after crossing over from New Mexico to be confronted by a line of wind turbines that stretched to the horizon. Some 40 miles later, they took a break for the city of Amarillo. They would resume on the other side of the city and continue, though somewhat less contiguously, well into Oklahoma. The astute geographer among you may note that Big Bend National Park is nowhere near I-40. We decided to reroute north to avoid the flooding from Hurricane Patricia. 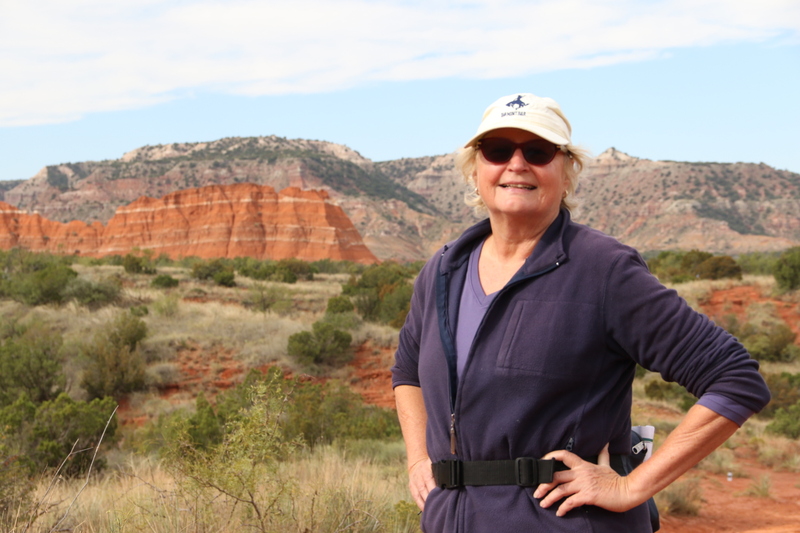 Fortunately, a Texan we’d met earlier in the trip told me the second largest canyon in the world is in the Texas panhandle. 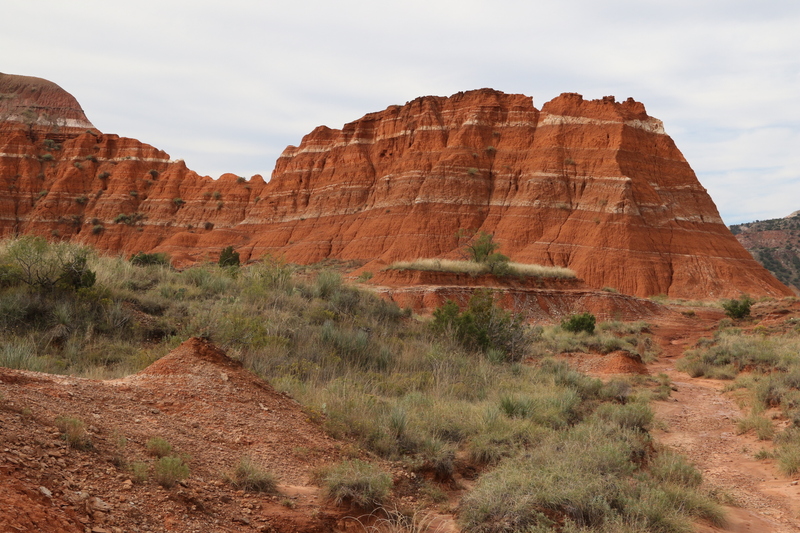 So we set our sites on Palo Duro Canyon, which actually lays claim to being second in the U.S. At 800-feet deep, it does not threaten to steal the title “Grand,” but it is an interesting and worthy stop along the way. The campground is located on the canyon floor. We parked the Wegwam and rode our bikes along the park road. The next day we hiked the favorite park trail, to the Lighthouse. 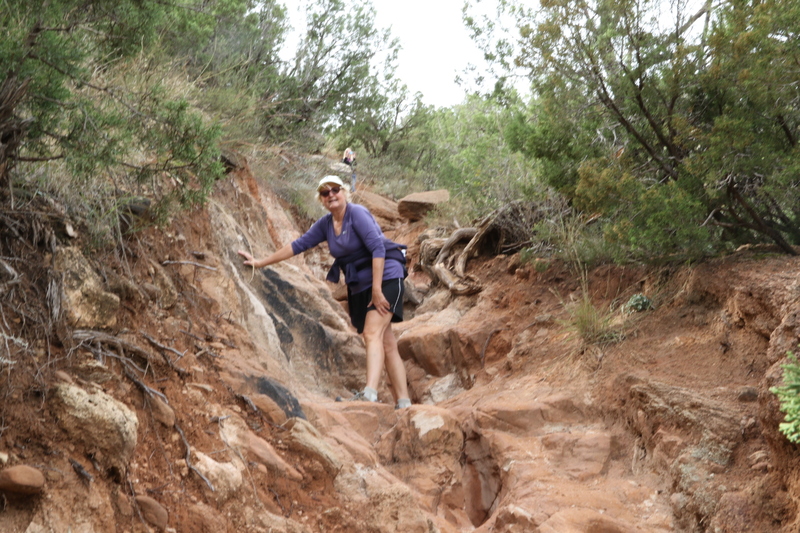 It’ a six-mile round-trip hike along a fairly level path through red-grounded desert. 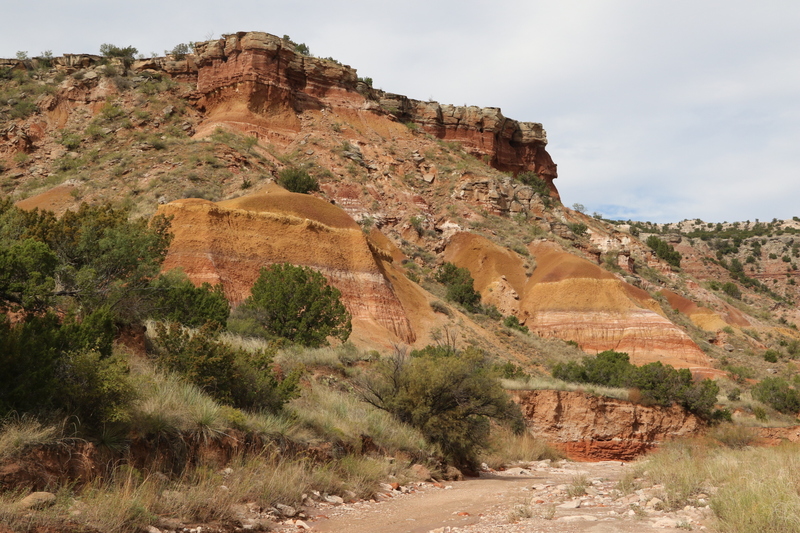 The canyon walls display excellent stratification and a variety of colors. In the heat of summer it would be a really testing endeavor, but in October it is a walk in the park. We were not alone. 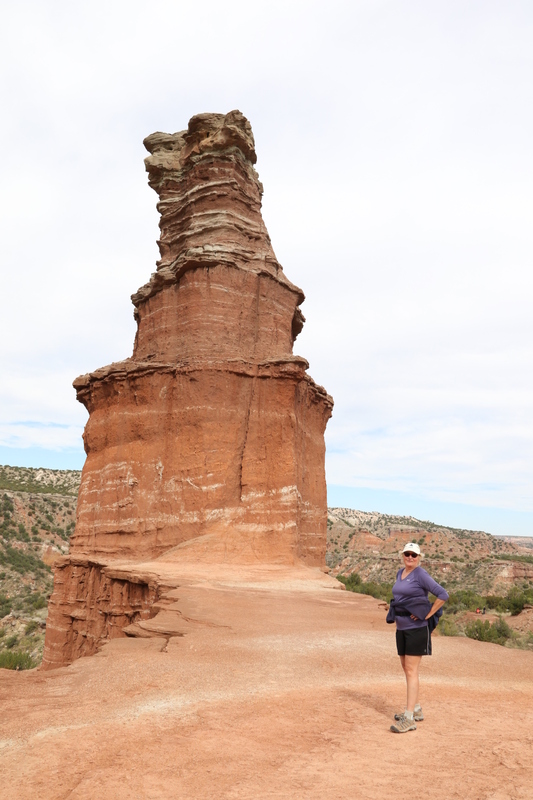 The hike culminates with a steep scramble up to the base of the Lighthouse formation, which of course is a lot bigger than it looks from across the canyon. 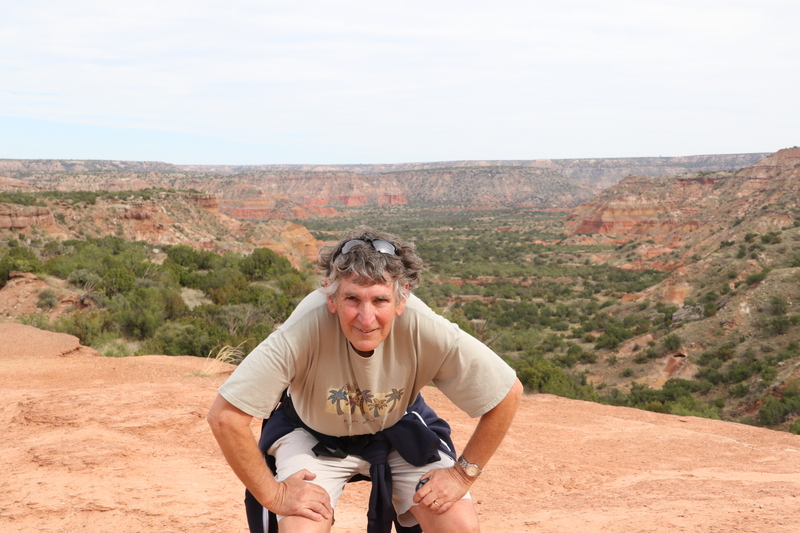 There’s also a great view of the canyon there. We heard a familiar noise from above. Sandhill cranes. Over the course of two day, more than a thousand passed overhead. I wonder if we’d seen any of them in Fairbanks. The park was booked for Saturday night, so we drove to Oklahoma City, where we “camped” in an RV park on the edge of the city bordering the Interstate, with what appeared to be 400 RVs. Not our favorite stop of the trip. I should note that east of Oklahoma City the landscape suddenly changes with the appearance of trees. Definitely getting closer to home.